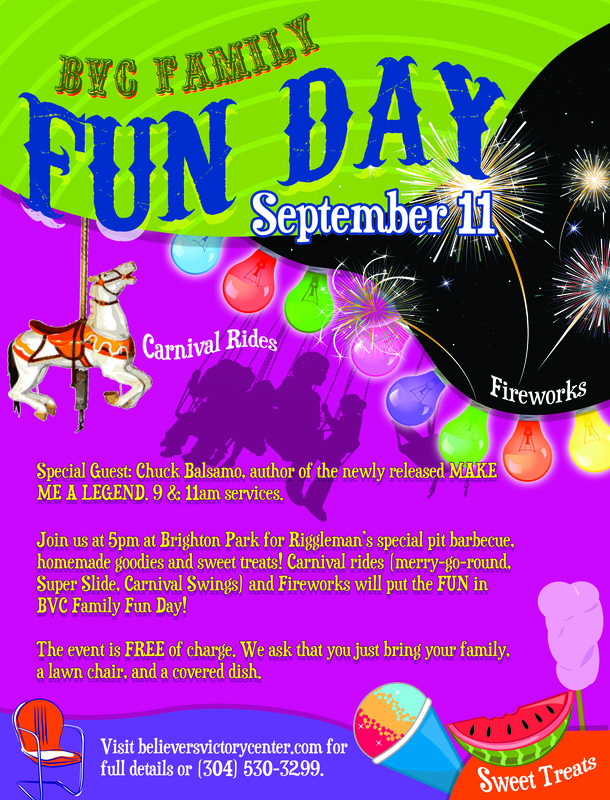 I am excited as the time nears for our annual BVC Family Fun Day. This year we will be kicking off the celebration in both of our morning services with Pastor Chuck Balsamo, author of the newly released book, MAKE ME A LEGEND. I consider Pastor Chuck to be one of my closest friends. He is a great husband, father, leader and is sure to excite the God given destiny in the hearts of all who hear him. 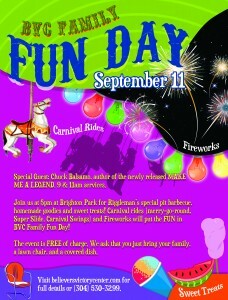 The second part of the day will be held at Brighton Park and promises to be a wonderful time for the entire family. Our picnic will begin at 4:00 p.m. and will feature Greg & Karen Riggleman’s special recipe, pit barbecue chicken as well as a bunch of other homemade goodies. After dinner it’s time to play! Five Star Attractions will be on site with a carousel, a super slide, and those awesome swings that all the kids go crazy for. And to be sure we don’t run out of energy, the Moorefield Volunteer Fire Company will be giving out snow cones and cotton candy, and it’s all free of charge. Now we could stop here and it would be a great day, but you know how we roll, we have to finish off with a bang, and I do mean a bang. At 8:30 p.m. the Starfire Corporation will unleash an awesome fireworks display to cap off our day of food, fellowship, & fun. Mark your calendars, invite some friends and I will see ya there.